You know how you know you're getting old? You wake up on a weekend earlier than you do with your alarm on a weekday. This past weekend I was up and ready to start accomplishing things before seven on both Saturday and Sunday. My go-to weekend look? Leggings and a tunic. Sunday mornings for me right now mean finishing my homework (I mean, no way, I never leave stuff until the last second), having a quick breakfast, and heading to class. I'm a weirdo and don't like coffee or tea, so I always bring my giant water cup along with me. What are your favorite items to wear during the weekend? I wore leggings and a tunic as well on Sunday! It's definitely my comfy but not in pj's look! Love the two-tone boots on you! So pretty! A) i'm pretty much obsessed with your hair color, and B) also your boots. Love this! I absolutely love those two toned boots. I think you really nailed a casual weekend look. 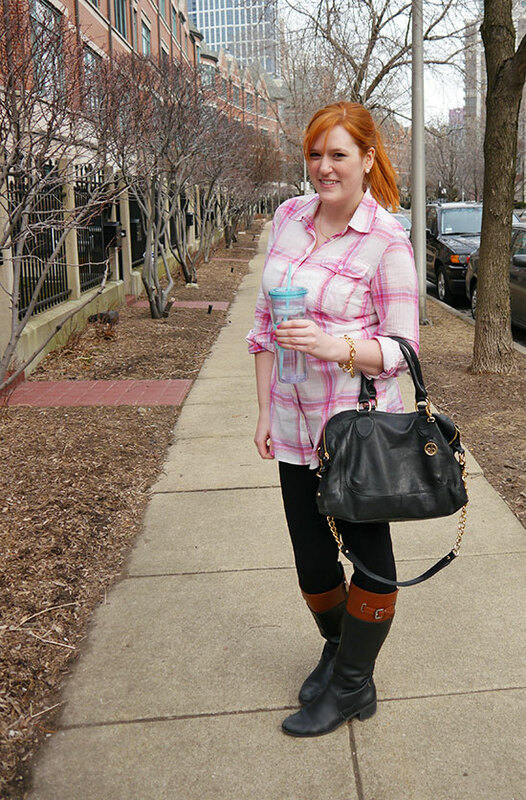 Love that top and the boots are perfect for walking around and doing errands! Very cute outfit. I am loving the boots! Such a great weekend look. Those boots are great. My go-to look is a pair of boyfriend jeans (my new fave) and an oversized tee. Not as classy, but what can you do? Loving those boots, Kristina! So super cute. you're so cute! i love the pink top! Thanks! I still haven't managed to try boyfriend jeans, I'm convinced they'll look terrible on me. Guess I should give them a go anyway. Thanks! I feel like I wear my boots 3/4 of the year, don't worry, yours will be back out of hiding soon! Comfy but pulled together is my fav. Love this sweet look! So perfect for a spring Sunday :) Though wish my getting older meant I was able to wake up before my alarm-- I still struggle with that all weekend long! Love the button down. I haven't tried the safety pin trick before, but it's a great idea! Thanks for the suggestion!